December dinners tends to be hearty and heavy. In a good way. I need chicken and dumplings and sausage and potatoes to keep me warm under turtleneck sweaters and snow boots. Sometimes, though, I need a break from weighty winter food. 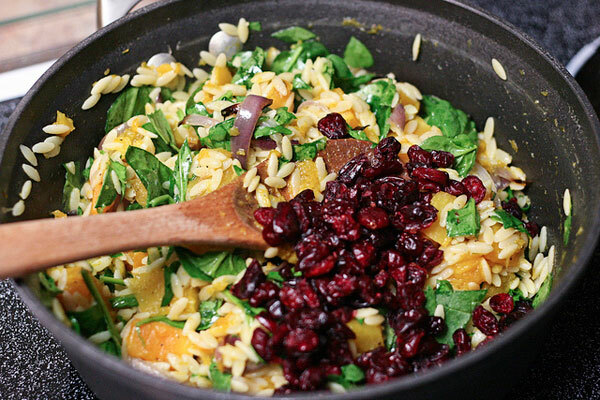 Enter roasted butternut squash orzo with wilted spinach and dried cranberries. We eat a lot of butternut squash during this time of year — in stews, in gratins, and roasted with maple and sage. It’s sweet and nutty and is a good source of fiber and vitamin C.
This particular dish can be eaten hot or cold, alongside pretzel-crusted chicken or on its own. It’s creamy and flavorful and looks oh so festive. So if you’re looking to add a lighter dish to your holiday menu, give this one a try! 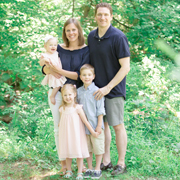 What do you eat when you need a break from standard winter fare? Preheat oven to 400°F. Line a baking sheet with foil (or use a stone casserole dish). 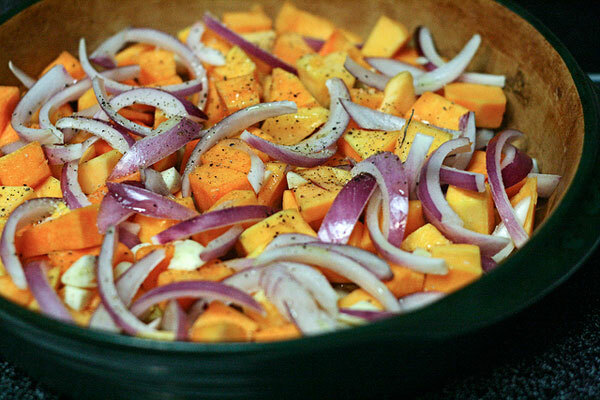 Place butternut squash cubes, red onion slices, and garlic cloves on baking sheet and drizzle with olive oil. Season with salt and pepper and gently toss. Place in the oven and roast for 40-50 minutes, stirring halfway through, until squash is tender. Meanwhile, cook the orzo pasta. Bring water to a boil and stir in orzo. 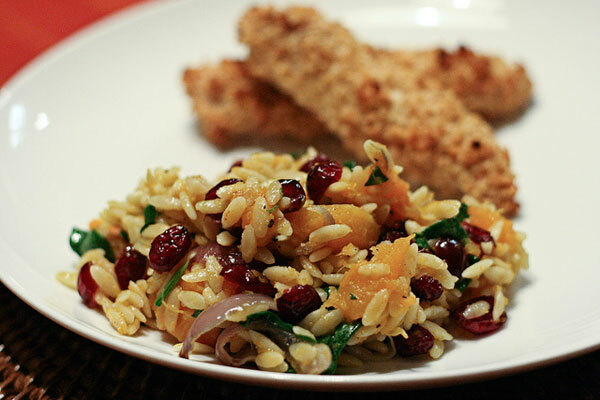 Cook for 10-12 minutes, or until orzo is tender. Drain orzo and put into a medium bowl. Chop roasted garlic and red onions. Add roasted butternut squash, garlic, and onions to orzo. Stir in spinach and dried cranberries. Drizzle with olive oil and season with salt and pepper. Stir once more. Serve warm or at room temperature. Lovely in every respect. My vegetarian daughter will be thrilled when I make this!